There’s no better experience than hands-on experience, and the School of Informatics, Computing, and Engineering is making sure its students have every opportunity to learn by doing. SICE is the home to five fabrication and prototype labs, dedicated makerspaces filled with the latest technology that allows students to bring their ideas to life. Among the labs are a fabrication lab dedicated to the intelligent systems engineering program, and an exclusive space in the SICE Living Learning Center that allows students to work on projects near their residence. 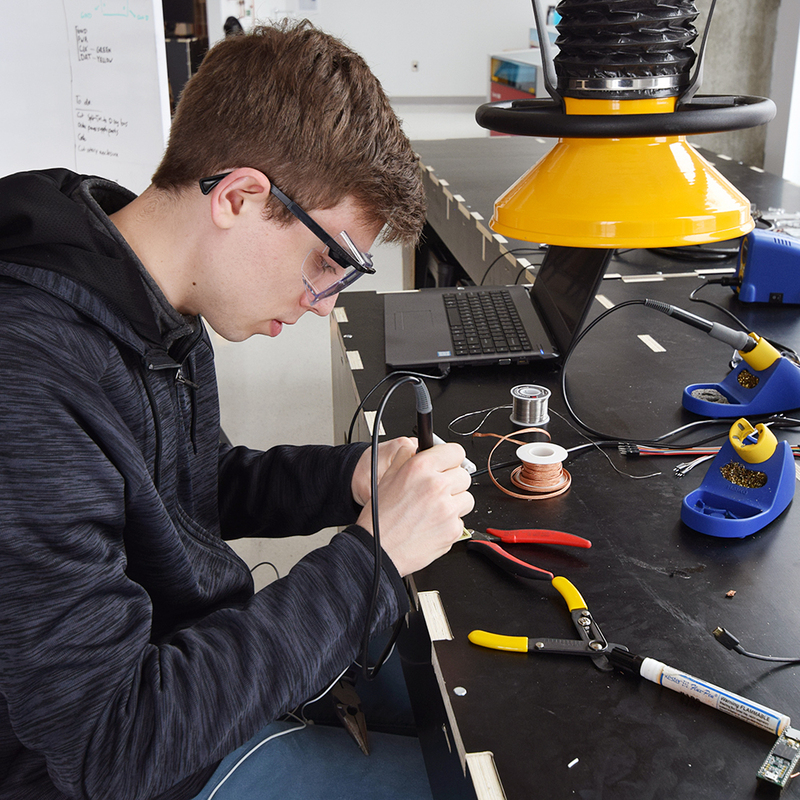 For Christian McKay, the director of SICE makerspaces, the labs are spaces where students can get an idea on how products come about and some of the challenges that exist in production. Both prototyping labs opened earlier this year. Protolab I is a 750 square-foot space located on the first floor of the Informatics East building and includes both the prototyping lab and a classroom. 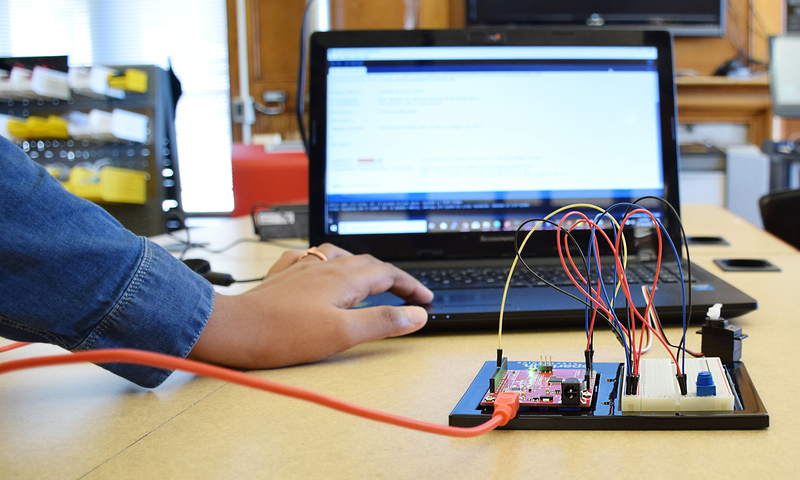 The prototyping lab features a laser cutter, 3D printers, a vinyl cutter, and other prototyping equipment, as well as a range of hand and power tools, equipment for electronics assembly and testing, and a library of hardware and software platforms, such as Arduino and Lilypad Arduinos. The space is a converted lobby and repurposes a fireplace to ventilate the area. “We may have the only baroque makerspace in the country,” McKay jokes. Protolab II is located at nearby Luddy Hall and consists of two 350-square-foot shops, one for woodworking and the other for metal working. The woodworking side offers a table saw, a band saw, a drill press, a compound miter saw, a small CNC router, and hand tools. The metal shop features a Tormach 440 CNC mill, a CNC plasma cutter, a welding station, a drill press, a cutoff saw, a grinder, and hand tools. The SICE Protolabs are run by technicians who train students to use the varying equipment to ensure safety. The fourth floor of Luddy Hall is home to the 3,000-square-foot ISE Fab Lab, a digital inquiry and fabrication space. Like Protolab I, the Fab Lab is split into two spaces, one for fabrication and a classroom. The class space features room for 36 students at four-foot by eight-foot tables as well as design stations that include computer-aided design programs such as Fusion 360 or Solid Works. The fabrication space offers a large-format laser cutter, a small format CNC water jet cutter, a Fused Deposition Modeling (FDM) 3D printer, a Stereolithography (SLA) 3D printer, and equipment for electronics building and testing. The SICE LLC makerspace, located on the first floor of the Teter Quadrangle Residence Hall, provides students the opportunity to continue their prototyping activities within a dorm setting and is outfitted with a laser cutter, a small bank of FDM 3D printers, hand tools, and electronics assembly equipment. The intelligent systems engineering program also is building facilities at the Multidisciplinary Engineering and Sciences Hall (MESH), which includes research labs and a digital fabrication space to support research efforts of ISE faculty and graduate students. The labs have allowed students in computer science, informatics, and ISE to use the lessons learned in the classroom in a real-world situation, and students in SICE’s Information and Library Science program also benefit from the makerspaces. 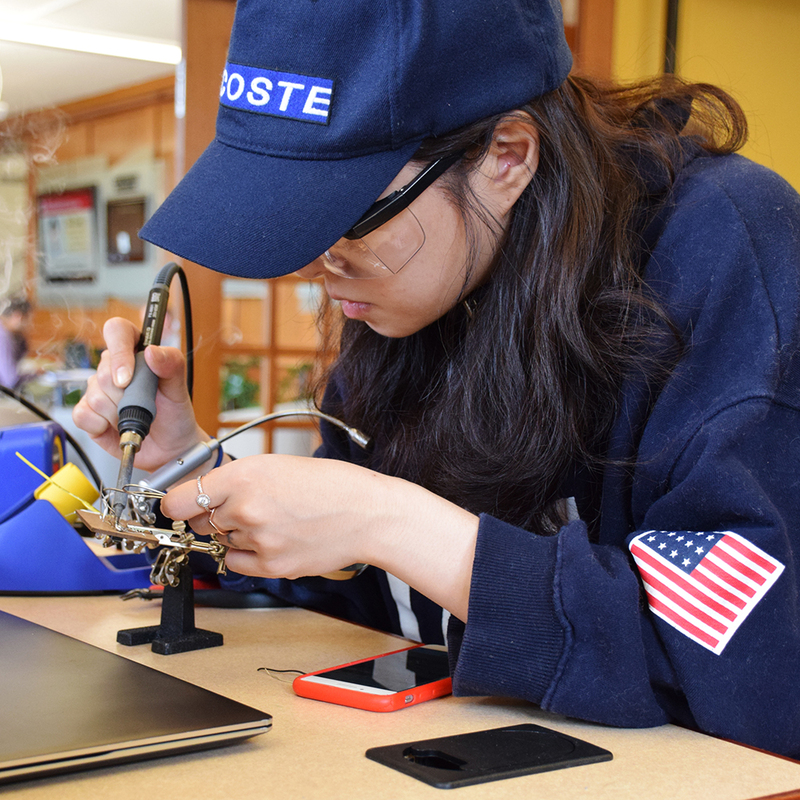 With libraries and museums becoming more interactive, makerspaces are starting to merge with those traditional institutions, and the SICE makerspaces are preparing students for what they may find in their career. For Travis Brown, SICE’s assistant dean for innovation, entrepreneurship, & commercialization, the school’s makerspaces provide an opportunity for students to build an understanding of some of the challenges they may face when imagining a product. Both Brown and McKay encourage students to explore the makerspaces even if they don’t have a vision for a final product in mind. Andrew Lillie, a senior in informatics, loves having access to cutting-edge technology. Xun He, a second-year graduate student in human-computer interaction, is a technician in Protolab I, and she enjoys learning how to use the equipment while teaching others. McKay is networking all the makerspaces at SICE and collaborating with labs at the School of Architecture, Art, + Design, the School of Education, and the Wells Library. McKay and Brown also are collaborating with IU’s University Information Technology Services (UITS) to become part of the MakeImpact Consortium, which is a large-scale networking collaboration with MIT and other member universities to provide tangible resources that speed integration of technology, innovation, making and entrepreneurship. McKay is also looking forward to a time when the makerspaces are humming with activity.